Each year more than five million flock to the Grand Canyon to see the staggering views. 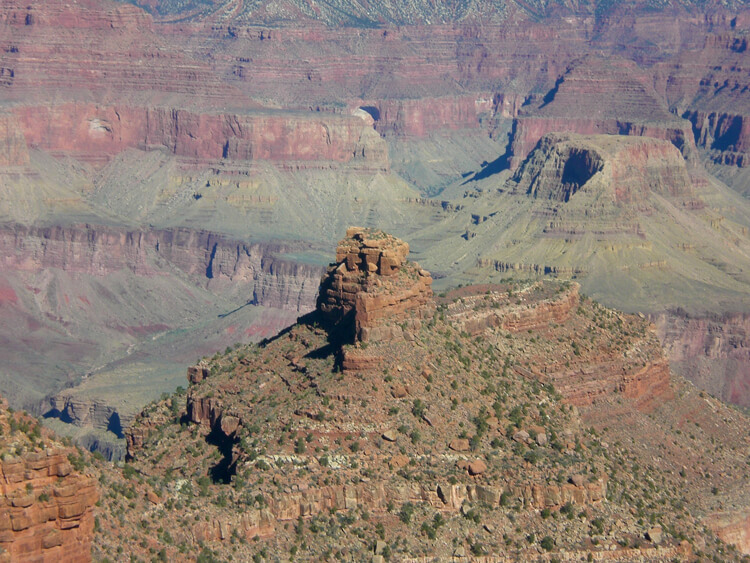 But forget the tour bus and don’t be satisfied with simply peering over the rim on your Grand Canyon trip. The best way to experience the Grand Canyon is from below the rim. 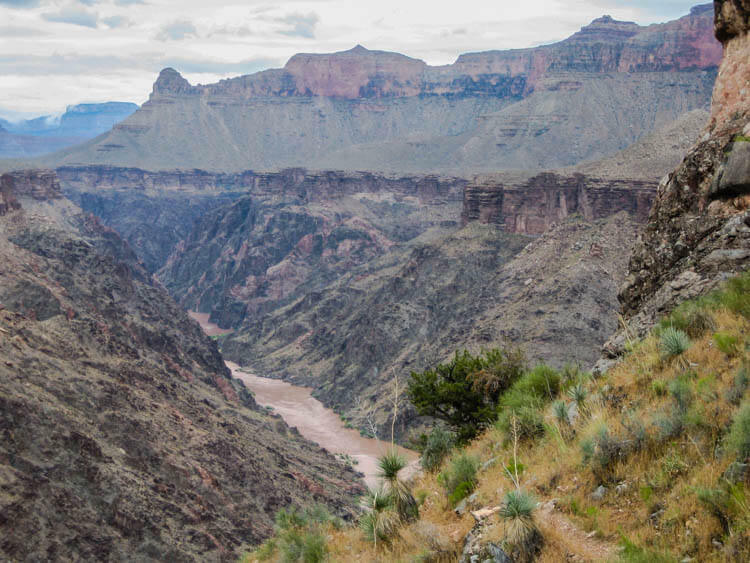 With more than 500 miles logged hiking the Grand Canyon trails, I consider myself a bit of an authority on the best Grand Canyon hikes and have rounded up these ones that are definitely worth pulling out your trekking poles and hitting the trail for. 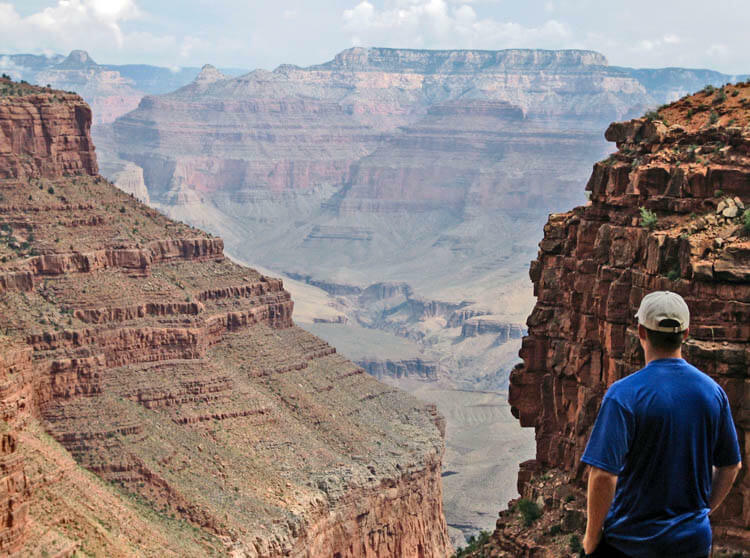 This guide to the best Grand Canyon hikes includes the following hikes. You can jump to a specific hike by clicking the links in the table of contents below. 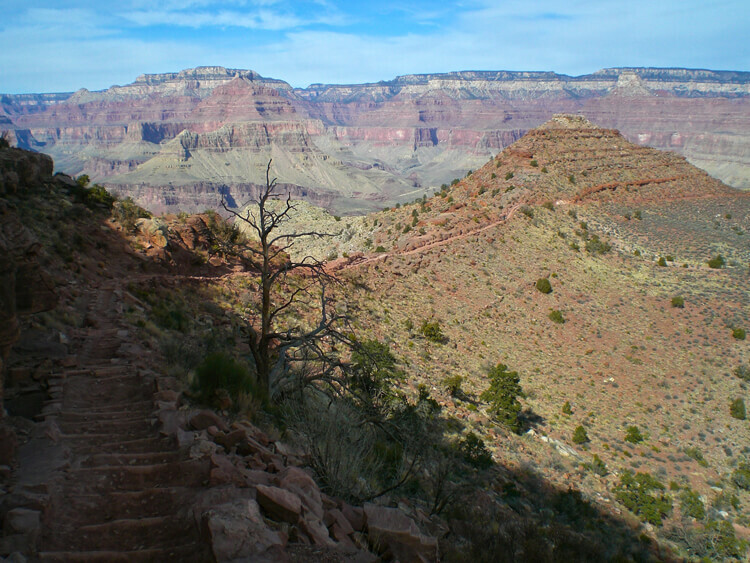 The South Kaibab Trail is one of the most scenic trails in the Grand Canyon and one of the best Grand Canyon trails for beginngers. It follows the path of a ridge line all the way to the Colorado River seven miles later. Going down may seem like a piece of cake, but if this is your first Grand Canyon hike I recommend turning around after the 1.5-mile mark at Cedar Ridge or the 3-mile mark at Skeleton Point. 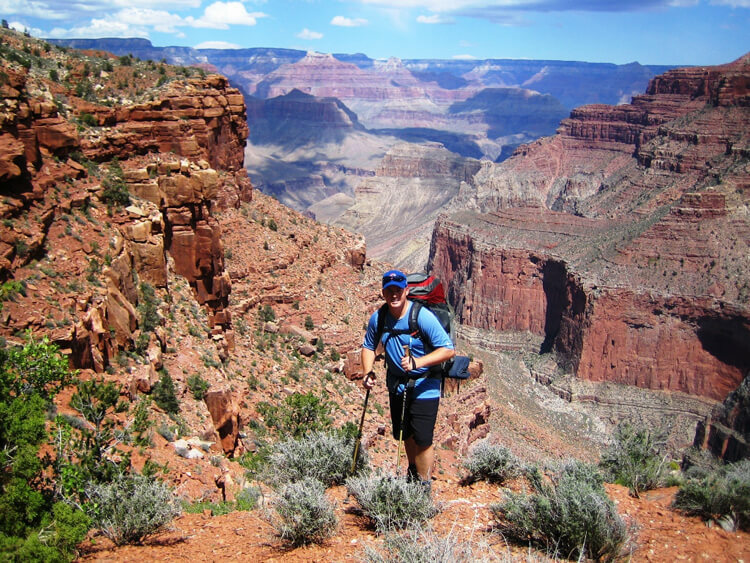 There isn’t any water available on the South Kaibab Trail, so pack at least 3-4 liters. 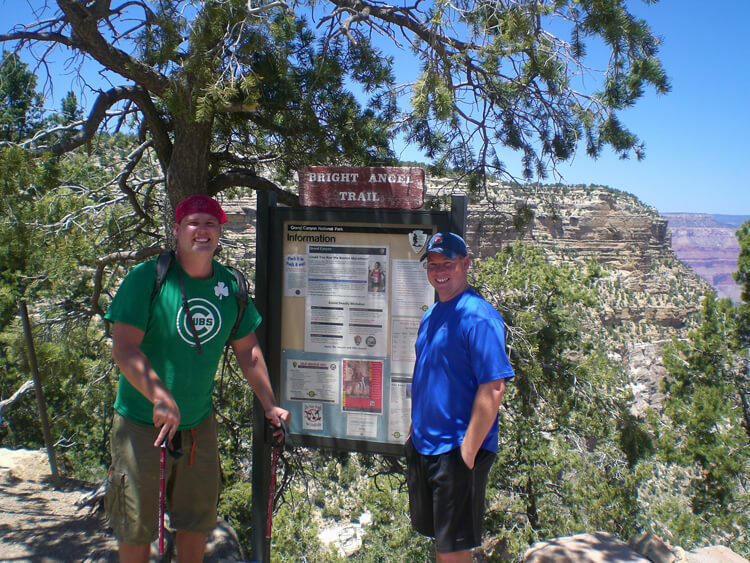 The Bright Angel Trail is the heaviest traveled trail in the Grand Canyon, but don’t let that discourage you. It’s one of the easy Grand Canyon hikes and the well sloped trail has water during the summer months at the 1.5-mile, 3-mile and 4.5-mile points at Indian Gardens. 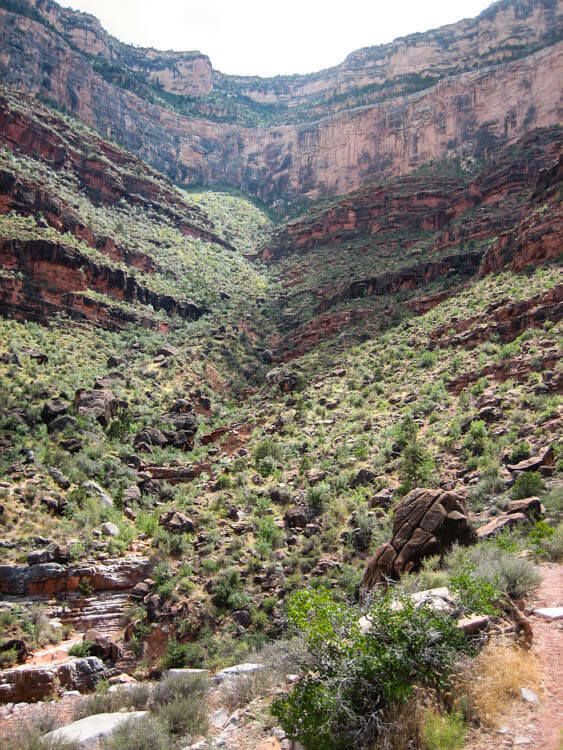 This is one of the best trails for an introduction to Canyon hiking. Be on the lookout for big horn sheep and deer along the trail. For those looking to venture off the main corridor trails, consider this hike on the Grandview Trail. 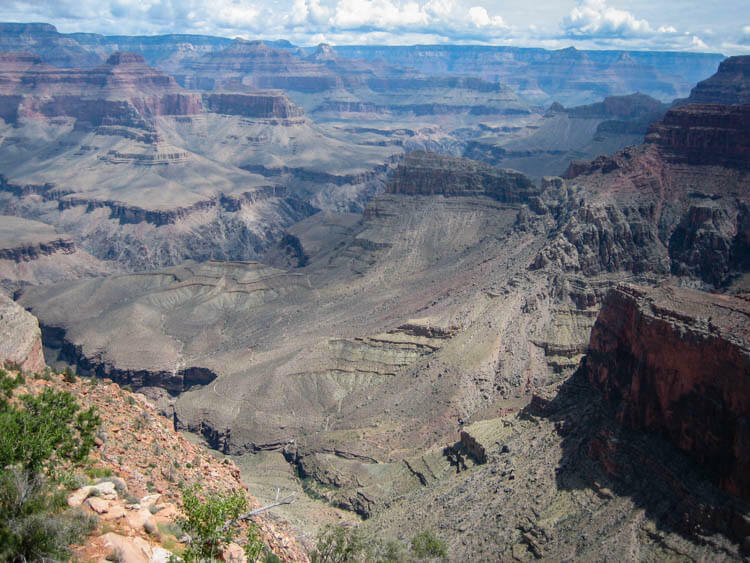 While the trail isn’t in as good of a condition as the South Kaibab Trail or the Bright Angel Trail, the Grand Canyon view will make it worthwhile as you descend into the giant horseshoe shaped mesa. There isn’t any water on the trail so bring at least a gallon for this 6-mile round trip hike. For those comfortable with some basic navigation of Grand Canyon trails check out the hike to Yuma Point. While it’s only six miles round trip, don’t take this hike for granted. Be sure to take the quick detour to Dripping Spring to cool off or load up on water. The views from Yuma Point are some of the best views in the Grand Canyon. If you are in good shape and ready to try a more challenging hike, take a look at the 12 mile South Kaibab Tonto Bright Angel Loop hike. You can make this loop in either direction, but I recommend starting at the South Kaibab trailhead. 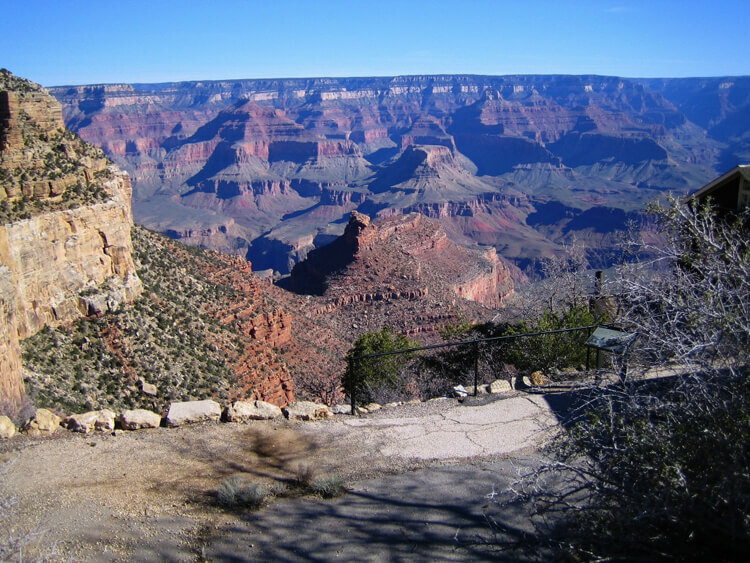 By starting at the South Kaibab trailhead, when you are tired at the end of the day you are hiking up the Bright Angel Trail which conveniently has water available every 1.5 miles and has some shade available in the afternoon. 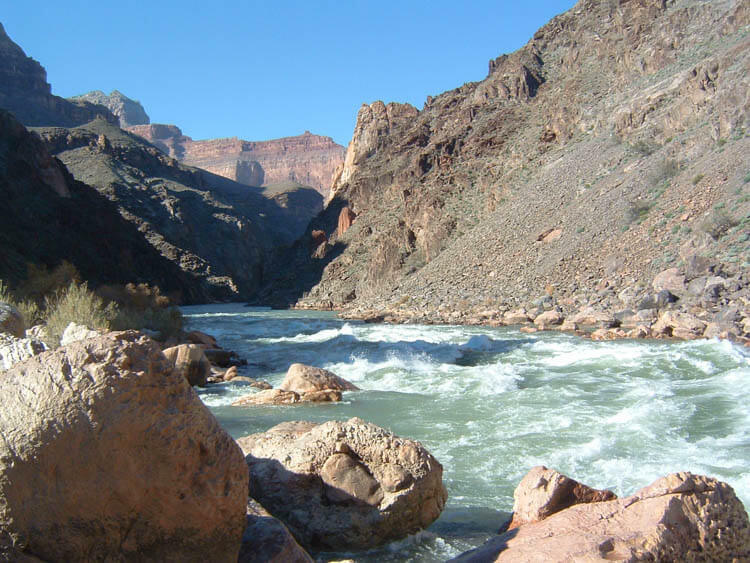 The South Kaibab Trail is my favorite way to get to the Colorado River. Fourteen miles round trip may not seem like much but you lose 3600 feet elevation in the process. Try to time your hike so that you are not hiking up the trail during the heat of the day. The only water available on the hike will be at Bright Angel Campground at the Colorado River, so plan accordingly. If hiking in the sun and carrying all your water isn’t your fancy, hit up the Bright Angel Trail. While it is longer than the South Kaibab Trail, you have water available at the 1.5-mile, 3-mile, 4.5-mile and 9-mile points. There is some shade to be found on the upper portion of the trail but not much around the Colorado River, so plan to avoid hiking during the heat of the day. 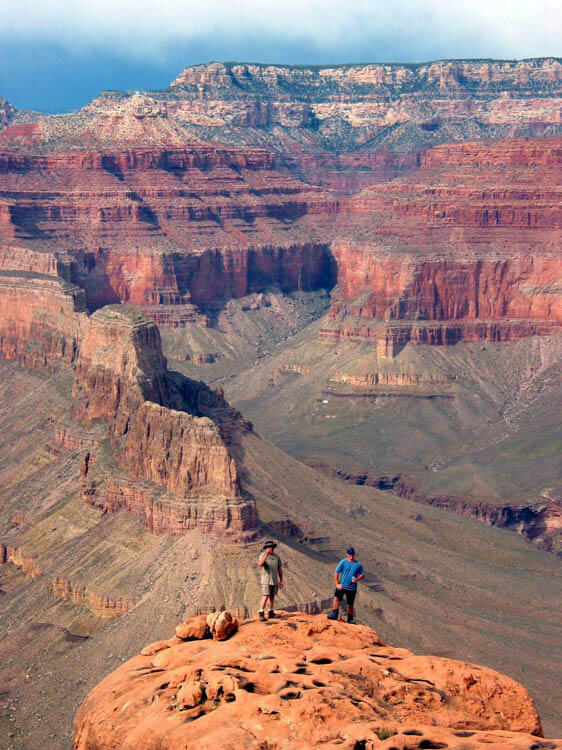 The ultimate hike for those seeking a grueling challenge is a Grand Canyon Rim to Rim hike in one day. Covering a minimum of 21 miles and 10,000 feet elevation change is no easy feat even for those who consider themselves fit. Temperatures can range from freezing on the rims to 100°F along the Colorado River. 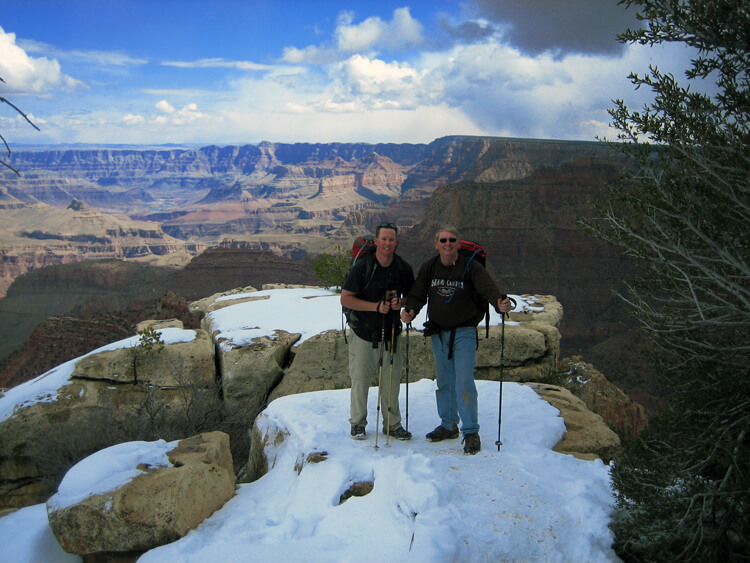 For a twist on the Rim to Rim hike stay one or two nights at the lodge on the North Rim and hike back across. Those truly insane (me) will do a Rim to Rim to Rim hike in one day. I accomplished a Grand Canyon Rim to Rim to Rim in 20 hours of hiking and it’s probably the greatest fitness test I have done to date. There are not many places left on this earth where you can get away from it all for a few days, but the Grand Canyon in Arizona is one of those places. Having spent over 50 nights below the rim and well over 500 miles on Grand Canyon hiking trails, here are my suggestions for some of the best backpacking hikes in the Grand Canyon. If you’ve completed some day hikes in the Canyon and are ready to explore the backcountry, the Hermit-Tonto-Bright Angel Loop hike is for you. Start by catching the shuttle from Bright Angel Lodge to Hermits Rest where you will pickup the Hermit trail. The trail climbs down into the Canyon for eight miles and you’ll find yourself at the Hermit Creek campsite area. The only water on the this portion is at Santa Maria Spring, which is 2.2 miles into your hike. Hermit Creek makes a perfect place to camp for the night and also as a perennial water source. I’m sure you’re exhausted from hiking down, but if you have time drop your pack off here and grab a day pack – or even just your camera and water bottle – and follow the creek down 1.5 miles to the Colorado River at Hermit Rapids. One day two of this hike you will pick up the Tonto Trail and head toward Monument Creek. Lucky for you this is only 3.5 miles and should only take about 2 hours. You will see a large rock pillar once you reach the Monument Creek Campsite. Here you have another chance to head down the creek to see the Colorado River at Granite Rapids. The path down the creek is impressive with large granite walls as you navigate down to the river. One day three you have an 11 mile hike along the mostly level Tonto Trail to Indian Gardens. You will not have any access to water until you reach Indian Gardens Campground, so plan accordingly. You will probably see more people at the campground than you have in the previous three days but have no fear, the atmosphere in the Canyon makes up for it. 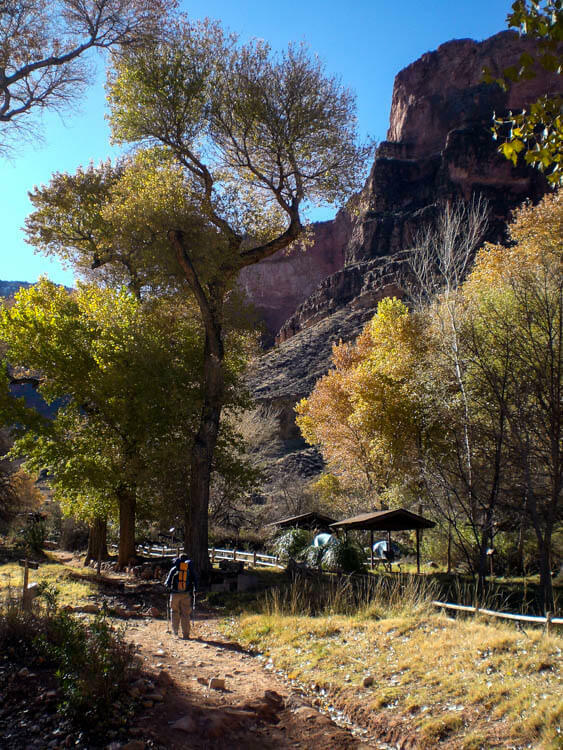 You could camp here or hike the remaining 4.5 miles up the Bright Angel Trail and out of the Canyon. Be warned it is a steep, but well graded climb to get out of the Canyon. A post-hike dinner at Bright Angel Lodge always hits the spot for me. 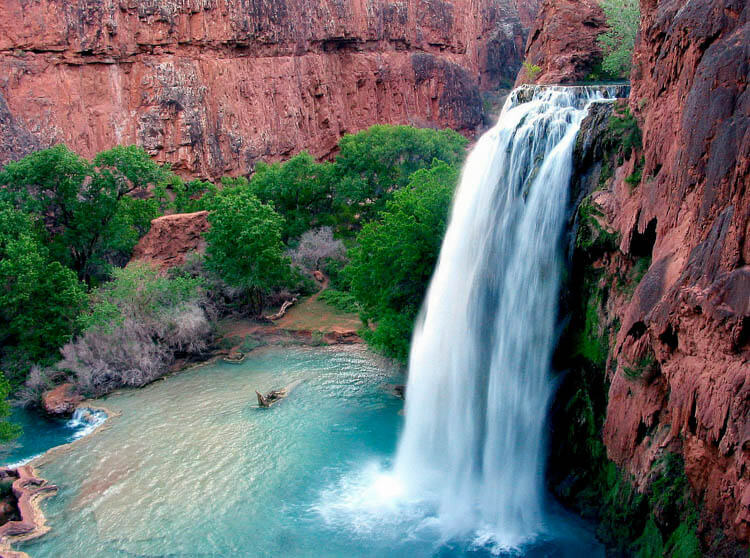 Undoubtedly you’ve seen the picturesque Grand Canyon waterfalls at the Havasupai Indian Reservation. 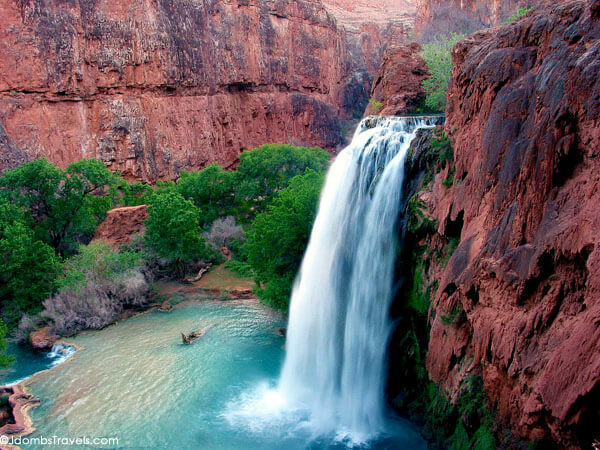 This Grand Canyon waterfall hike is a fairly easy 8-mile hike down to the Supai village where you get your permit and can load up on some last minute supplies. 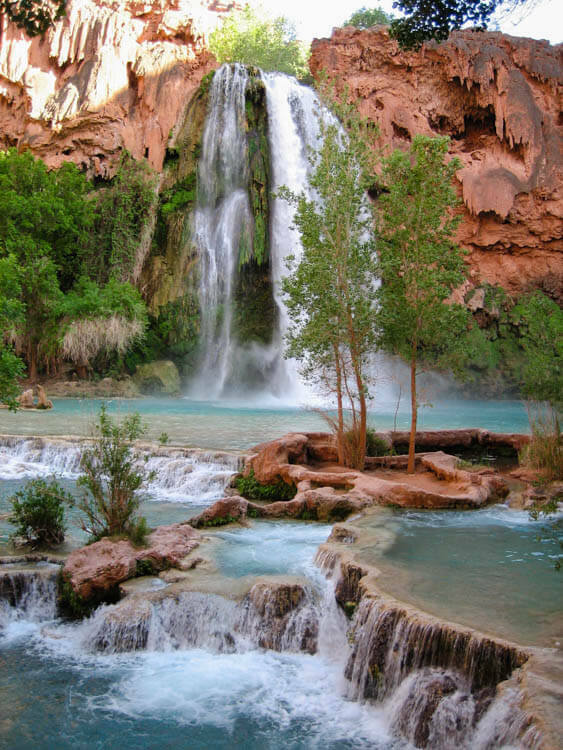 From the village it’s another 2-mile hike until you reach the campground just after you pass the stunning Havasu Falls. 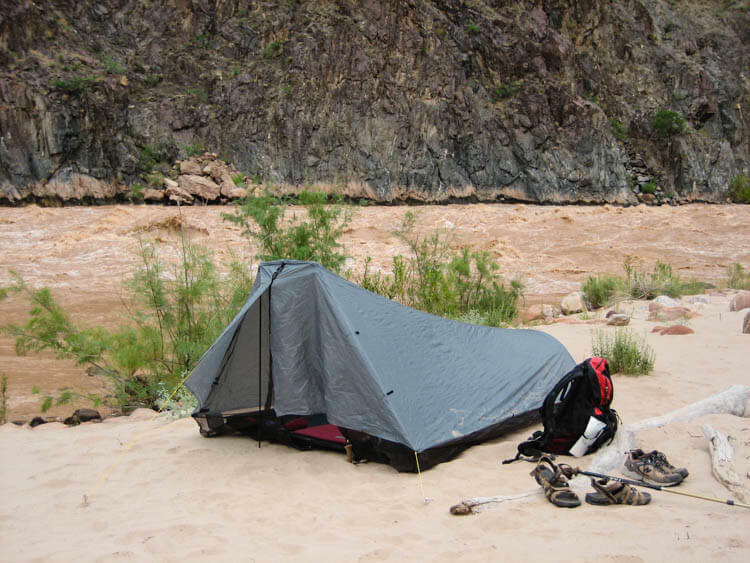 Claim a camp spot, set up your tent and then head another half mile down the trail to Mooney Falls. There are plenty of places to relax, swim and cool off in the creek or below the waterfalls so take a load off and just enjoy the scenery. The next day if you hike down the Canyon some more, you can reach Beaver Falls. Officially it is three miles but does cross the creek a few times, so it makes a good turnaround point and spot to enjoy your lunch. It is possible to hike another five miles to the Colorado River. 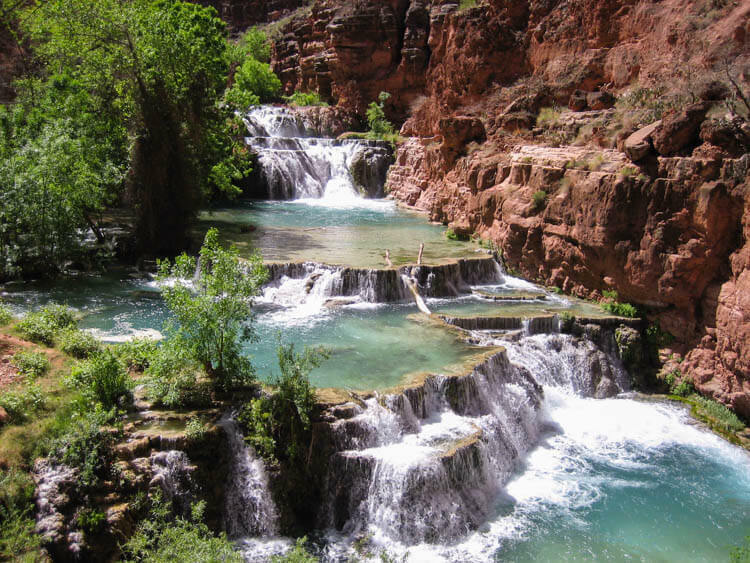 I haven’t done it and with the beautiful turquoise waters of Havasupai, I’m not sure why you would want to hike to the muddy Colorado. This place could be a real paradise, but I found the campgrounds overrun and bathroom facilities (port-a-potties they helicopter in and out) filthy. There is no doubt the waterfalls are breathtakingly beautiful and make up for any short comings at the camp. A word of caution is to check the weather; the Canyon has had numerous flash floods and stranded tourists or, worse, some have died being swept up in the floods. 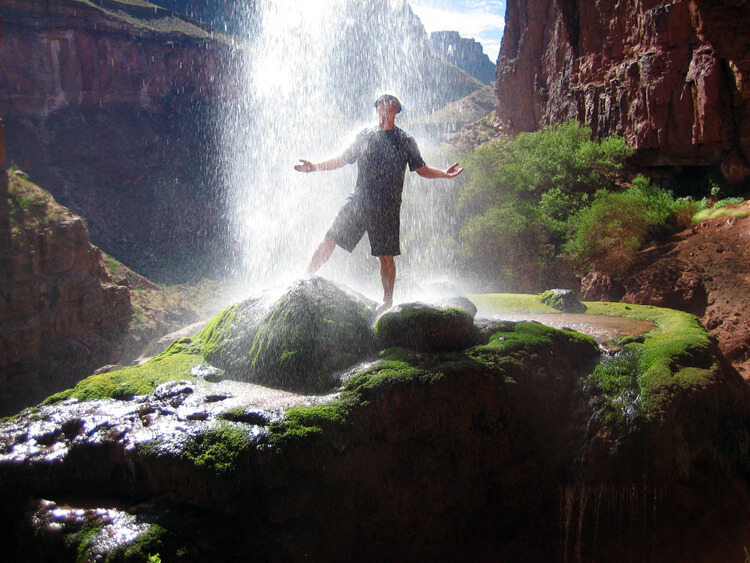 If you’re really worried about the dangers like flash floods and the heat, or you just don’t have a hiking partner you can convince to join you, the adventure company Just Roughin’ It does have Grand Canyon hiking tours to Havasu Falls. 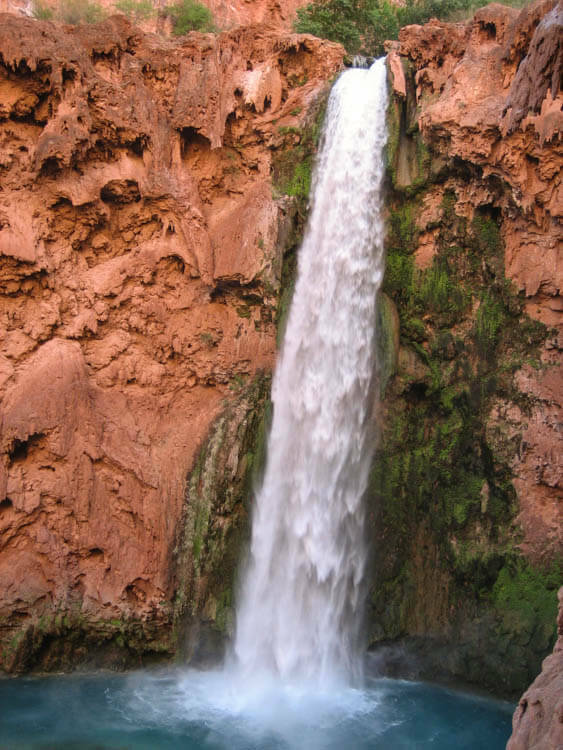 They also put together an excellent blog post with more tips for hiking to Havasupai Falls. The hike begins from the Hermits Rest trailhead and you will start by taking the Hermit Creek trail down for two miles to where it splits and pick up the Dripping Springs Trail. This will go for 1-mile to Dripping Springs, which is your only water source (seasonal so check with the backcountry office when you pick up your Grand Canyon hiking permit for conditions) along the trail and intersect with Boucher Trail. Take the Boucher Trail for 2.5 miles and you will be at Yuma Point. Yuma Point makes a great resting point to take in the view and a good lunch spot. After Yuma Point the trail drops significantly along the slope toward the bed of Travertine Canyon. The trail can be difficult to follow through the redwall and does require some light climbing and trail finding ability. I did this hike in August one year and it pushed the limits of my late twenty-something year old body. You will reach Boucher Creek after 9.3 miles, which you’ll swear was actually 15 miles. Boucher Creek always has water and will feel like an oasis after the punishing hike down. You can hike the easy 1.5 miles to the Colorado River. 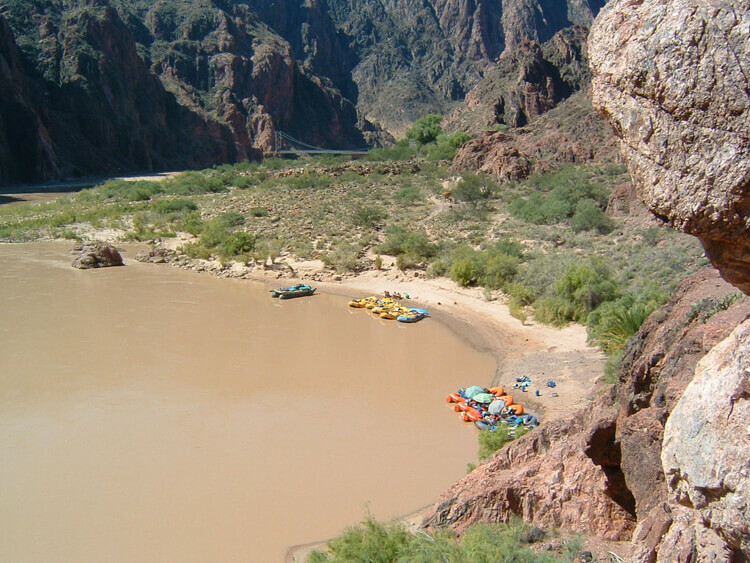 There is a large beach there and Grand Canyon rafting trips like to stop there. I was lucky enough to catch a river rafting group that had set up camp there. They are notoriously nice to backpackers and will typically invite you for dinner or at least a few drinks. The next day you hike back up to the Tonto Trail and take it across five miles to Hermits Creek. You can explore among the ruins of the old cable car or head the 1.5 miles down to the rapids at the Colorado River if you wish. The final day be sure to load up on water for the steep 8-mile hike out on the Hermit Trail. 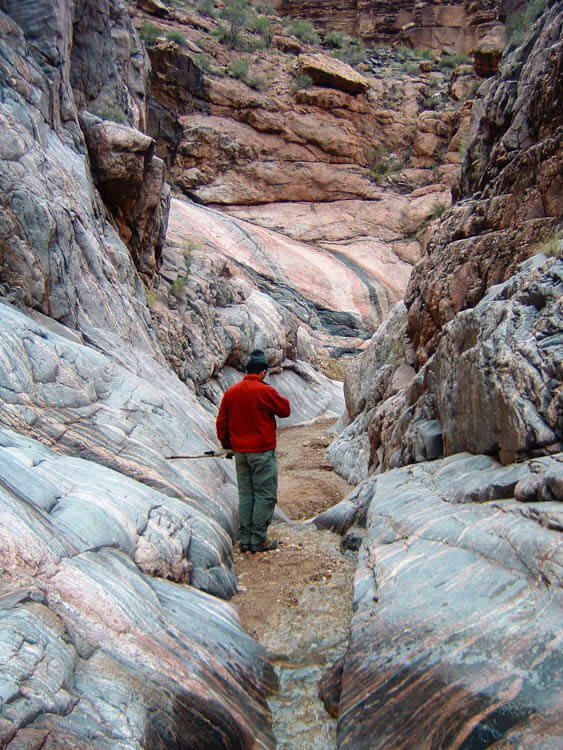 Hiking can be inherently dangerous (have you watched 127 Hours?!). Please be prepared for each hike that you attempt. Information provided here is meant to peak your interest in a hike and I highly recommend further researching each hike and contacting the Backcountry Ranger Office. A great research tool for all the trails I’ve mentioned is Hike Arizona. You can find detailed information on each trail as well as GPS routes and a community forum if you have any questions. You might also want to purchase a Grand Canyon hiking trails map to carry regardless if you plan to do a day hike or a multi-day backpacking hike. All of the hikes mentioned here are meant for serious hikers in search of a challenge; these aren’t just “walks in the park”. The Grand Canyon is on my list of places to visit soon and I love this recap! Hikes are a great way to see the best of national parks and these suggestions are great. Thanks for sharing! I’ve never hiked in the Grand Canyon, but it looks wonderful in the right weather! It is so stunning and truly, hiking it is the only way to really appreciate it’s magnitude and awesomeness. Great post! The Grand Canyon is definitely on my travel bucket list! The views just look breathtaking. And what an adventure it would be to hike it! 🙂 Thank you for sharing all of your helpful tips- especially about which trails you should carry water on. My kids and I went to the Grand Canyon last year during Spring Break. We got some tips from the locals on where to find hidden petrolyphs and other things that made it really fun. I love that there are hikes for all skill levels too. And the views cannot be beat! Wow. One more reason I need to get to the Grand Canyon! Loved the variety of options you included. Thanks for sharing. Will definitely be saving this post for later! 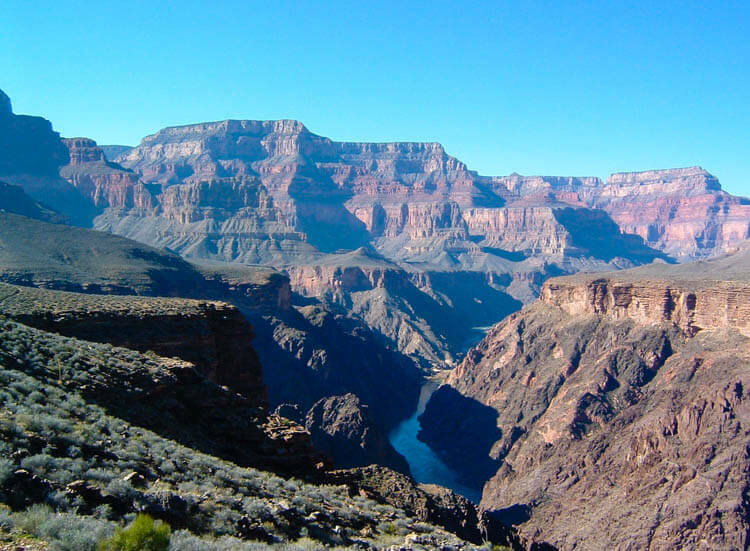 I live within driving distance to the Grand Canyon – it’s a shame I haven’t spent time there. Maybe this needs to be our family vacation this year!! While I’ve traveled so many places around the world I’ve somehow missed a Grand Canyon adventure. My husband tells me over and over that we have to go…he says it’s amazing. I know my boys would love it too. Thanks for the reminder. Pinning this one for sure! We were just talking about wanting to do this one day when the kids are old enough to enjoy and appreciate it. I have no idea what the hiking options are, and we are definitely beginners – I am anyway! Thank you for sharing this. Bookmarking it to come back to. I have just started getting into hiking and reading this post makes me want to head on over to the Grand Canyon. I have never been there before and it’s totally on my travel bucket list. Great article. Extremely informative. Absolutely awesome photos too.